Many people have been asking which payment processor to be used to withdraw funds from ClixSense after all the PayPal fiasco. So, I have decided to make a post which shows a clear comparison of fees incurred between the available payment processors at ClixSense and clear the confusion once for all. So, let us look at 3 scenarios with different amounts of withdrawals. Balance available in your Payoneer account will be $18 and when you withdraw this amount to bank account, Payoneer will charge a 2% conversion fee for converting USD to INR on the mid-market rates. So, on 20th February 2017, 1 US Dollar equals 66.95 Indian Rupee. That means you will receive 65.62 INR against USD after deducting the 2% conversion fee which is 1.33 INR in this case. The total amount you will receive to your bank account here will be 18*65.62= 1181.16 INR. The total amount you will receive to your bank account here will be 98*65.62= 6430.76 INR. The total amount you will receive to your bank account here will be 198*65.62= 12992.76 INR. Now lets compare these three scenarios with PayPal and see how much we loose/gain with it being not available. So, on 20th February 2017, 1 US Dollar equals 66.95 Indian Rupee. That means you will receive 64.61 INR against USD after deducting the 3.5% PayPal conversion fee which is 2.34 INR in this case. The total amount you will receive to your bank account here will be 19.60*64.61= 1266.35 INR. The total amount you will receive to your bank account here will be 98*64.61= 6331.78 INR. The total amount you will receive to your bank account here will be 196*64.61= 12663.56 INR. So, with the above calculations we can say that Payoneer is actually better than PayPal for higher withdrawals because of its $2 fixed fee per cashout. However, if you tend to withdraw small amounts below $70, Payoneer is not what you want to choose. Look below the fees for Payza and you will know why. Let's calculate the fees similar to what we have done with Payoneer. Comparing this amount ($10) with PayPal we would have got 633.17 (See above for calculation of PayPal fee and conversion charges). Therefore the loss here for withdrawing $10 from ClixSense using Payza against PayPal is 633.17-554.28= 78.89 INR. Since minimum withdrawal for Payoneer is $20, there is no point comparing it here in this scenario. The total amount you will receive to your bank account here will be 19.12*65.28-(60)= 1188.15 INR. Comparing this amount ($20) with PayPal we would have got 1266.35 (See above for calculation of PayPal fee and conversion charges). Therefore the loss here for withdrawing $20 from ClixSense using Payza against PayPal is 1266.35-1188.15= 78.20 INR. Comparing this amount ($20) with Payoneer we would have got 1181.16 (See above for calculation of Payoneer fee and conversion charges). Therefore the gain here for withdrawing $20 from ClixSense using Payza against Payoneer is 1188.15-1181.16= 6.99 INR. The total amount you will receive to your bank account here will be 96.8*65.28-(60)= 6259.10 INR. Comparing this amount ($100) with PayPal we would have got 6331.78 (See above for calculation of PayPal fee and conversion charges). Therefore the loss here for withdrawing $100 from ClixSense using Payza against PayPal is 6331.78-6259.10= 72.68 INR. Comparing this amount ($100) with Payoneer we would have got 6430.76 (See above for calculation of Payoneer fee and conversion charges). Therefore the loss here for withdrawing $100 from ClixSense using Payza against Payoneer is 6430.76-6259.10= 171.66 INR. Clearly the winner here in this case is Payoneer. With such heavy bank withdrawal and conversion fees, Skrill is not recommended as a payment processor for Indians. With such heavy fees to bank withdrawal, Paytoo can be conveniently ignored as a payment processor for Indians. The balance in Tango card can be used to redeem various gift cards for US and other international based websites and stores. It can also be used to redeem the balance to BitCoin too. So, if you require such gift cards or BitCoin this would be an option for you. I do not have much information about this so, I am unable to list the charges or fees. If anyone knows the same, you may comment below and will update the same. P.S. I have made a lot of effort to gather all this information here. There might be some omissions or errors. Please let me know if you find any so that I can update the same. 47 members like this post. As of July 17th, the minimum cashout required for Payoneer has been lowered from $20.00 to $10.00. Shukriya uzair bhai lagtha hain apne mehnat karke info ikkathe kiye hain. Thanks for the info! Its kinda taking long for my documents to get verified on payoneer it has been 4 days but it took only 2 days to get verified on payza and that too on a weekend! Thank you so much this was helpful. I feel Payoneer is best (personal opinion) and will let you know how it goes. And thanks for the info, very helpful. ^ Thanks. I have updated it now. After deducting the 2.90 % + $0.30 USD fee per cashout (This fee does not apply to Payza Personal Starter accounts) Thanks for the valuable information. Now, I will go ahead with Payza. are you sure "Withdrawal to bank account" is Free? Under fees and charges Payoneer says it will charge 2% on the total amount for bank transfer. currency conversion charge is different. Payoneer is the worst Payment Processor!!! See below the level of defiance Payoneer is doing to the Indians!! I am an Indian too so I have placed it here for your viewing, understanding and consideration! Payoneer told me they have received a payment from Clixsense, then they said they will transfer the same within next 4 days & on 17th of February they made the first attempt of transfer, which they didn't actually! Then on 20th I have called them up to enquire if they have transferred the money because I have not received any mail from them that they have done so, neither i have received any bank confirmation of such a transfer. Then on 20th when I called them up, they said my bank refused payment for which they will mail me the reasons & they would load my money again on the same day for transfer & I shall get it by 24th of February, 2017. They did not give me any reasons over email as to why they failed to transfer, whereas my bank informed me they have no technical issues that such payments can be refused. I informed them over phone that my bank saw no reasons why it can be refused for acceptance. Now again they made another attempt on 24th of this month and told me to wait upto 27th of this month. It is very much clear from their replies and false emails that all of their efforts are just an eyewash to divert our attention and delay the payments beyond expected time frame. I have not seen such a bad payment processor and since your company requested us to make transfer taking help of Payoneer, we got connected to Payoneer, so you cannot shake off the responsibility of misleading us into dealing with such a fraud company with intentionally causes breach of trust and says lies every time when a customer calls up! To prove this. Look at my transactions. I have withdrawn $332.87 from ClixSense to Payoneer. I have received $330.87 to my Payoneer account after deducting $2 fees. 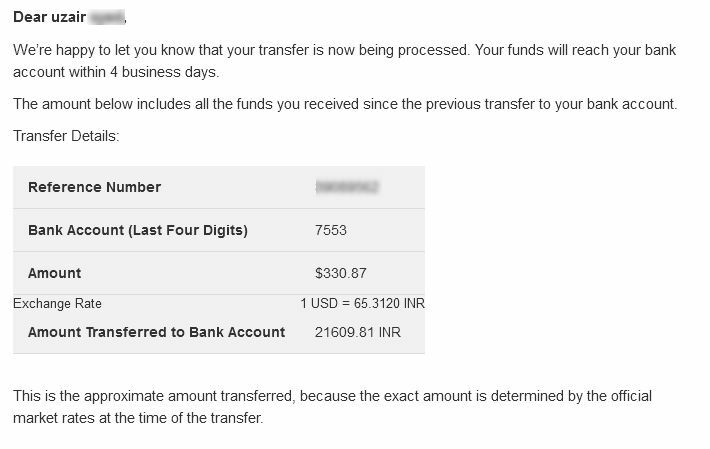 Payoneer has send me the below email saying that $330.87 are being transferred to my bank account. There were no bank transfer charges except the conversion fees. Can anybody confirm that if they have received money into their bank from payoneer .